It was early 1977. I was a student at Oak Harbor High School in Northwest Ohio and I remember this event without straining any of my 1970’s damaged brain cells. It was a Thursday afternoon and I was stuck right in the middle of art class. That’s right….I said art class. I finally admit publicly that I took art in high school. Why I remember this so clearly is because I remember the music playing in class. Mrs. Cherry was the art teacher. She was young and made art fun. More importantly, she played music in her class. This day we were listening to “Wings Over America” by Paul McCartney and Wings. Now… I would love to tell you that I was a good artist. Also, I would love to tell you that I took the class to become a better artist. But neither one of those reasons would be true. I took art class for the same reasons that motivates almost every other 16 year old male to do anything in High School… it was an easy “A” and for the girls. It really came down to simple logic. In 1977, I was 5’4″ and 105 lbs. Football was not an option. So, I ran cross country. Obviously that was not going to help my reputation with the ladies. I took Choir, in the hope that I could somehow sing my way into the heart of a pretty girl (and the easy “A”). Those of you that have ever sat next to me in church know the unfortunate ending to my choir endeavor. Then I remembered that way back in the fifth grade I had won first place at the Ottawa County Fair for a pencil drawing. “That’s it!! !”, I told myself as I scheduled my classes that year. I would take art. I mean how hard could it be? It was an easy “A”, you get to draw, listen to music and of course there would be girls in the class. Girls like art don’t they? The ideas were just flowing and my creative juices were at an all time high. The possibilities were endless. The concept is very simple. Take a lump of clay and shape it and mold it into something beautiful. Maybe a perfectly shaped vase or cup, maybe even something abstract that would be cool to have on my book shelf at home. Mrs. Cherry was up in front of the class giving instructions, but I did not have time for that. This was what I was waiting for. This would be my opportunity to do something great, something that just came naturally to me. So I indeed did what came natural to me…I took that clay and rolled it out on my desk. Visions of my finished project was so clear to me and I made a great master piece with that clay that day. Surely, Mrs. Cherry would be impressed by my perfect clay sculpture sitting on my desk. I was real proud. It had taken a mere 45 seconds to create the perfect ash tray. Now the interesting thing is that I have never smoked, more importantly, no one in my family smoked. Why an ash tray…I don’t have a clue. But when you think about it, this class is an easy “A” and taking anymore time than that to make something else would interrupt my time listening to music and trying to impress the girls in the class. I sat at my desk just admiring my handiwork. “You know, this pottery stuff is easy and I am good at it”, I thought to myself. I finally found something that I was good at. With my perfect ash tray sitting on the corner of my desk, I looked around the room and took pride in the fact that I was the first one done. What could possibly be taking the other students so long? They were working and kneading the clay with their hands. Picking it up and slamming it down on the desk. I mean they were really working the clay, pressing down and working their hands into the clay. It really took them a long time to make their creations. I was just about to tell them they were doing it wrong when Mrs. Cherry told us to take our work and place it in the closet. We were going to let them dry and harden over night and then glaze and fire them the next day. I hurried into class on Friday. I could not wait until I would get to my perfect ash tray and start the process of glazing it and then firing it to get the finished product. I had picked out the perfect glaze for my ash tray. Black Metallic. It would be so cool when it was done. I put an extra heavy coat of the glaze on my wonderful piece of art. Something this perfect needed a little something extra and that did the trick. As I walked with my creation towards the kiln for it to be fired, Mrs. Cherry reminded us that our final grade depended on the outcome of the firing process. I stopped in my tracks. “What did she just say?” flashed through my mind. She continued, “Remember from class yesterday when I said that any imperfection in the clay like air bubbles, small pieces of dirt or too much glaze would cause the clay to crack and be destroyed in the firing process.” What? I hadn’t heard that!!! I looked down at my project and thought that something that looked this good could not possibly be “marred” by invisible imperfections. I placed my handiwork in the kiln confident that all would be fine. On Monday, I walked into class with the full expectation that my little creation would be done. I walked over to the kiln and watched as other students pulled their projects from the oven. I was just about ready to reach down into the kiln when Mrs. Cherry said, “Don’t bother.” I looked up and she was holding scraps of what was once my perfect ashtray. It had indeed exploded in the firing process. My project was a complete failure. She started to explain to me that I had not properly worked the clay. My lump of clay was filled with tiny air bubbles that needed to be worked out the clay. That is done by slamming the clay down on the desk and forcing the air out of the clay. Also, I needed to spend time working the clay with my hands to ensure that all small pieces of dirt or stones would be worked out of the clay. If any of these imperfections were hidden in the clay it would not survive the firing process. My project was now “Exhibit A” for the rest of the class. Instead of gaining attention as a result of my beautiful masterpiece, I was now the center of attention for what not to do. Over thirty years later when I run into people who were in that class with me, they bring up this event. But not all of it is a bad experience, for as a result, I learned some valuable lessons from this failure. The prophet Jeremiah was told by God: “Arise, and go ye to the potter’s house and there I will cause thee to hear my words. Then I went down to the potter’s house, and, behold; he wrought a work on the wheels. And the vessel that he made of clay was marred in the hands of the potter; so he made it again another vessel, as seemed good to the potter to make it.” Note that when Jeremiah stated that when the potter thought the clay was marred, the potter started over and made a new vessel. The potter knew that the marred clay would never make a good pot, so he reworked it, re-wedged it and tried again. 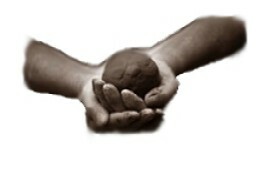 We are like marred lumps of clay because we have all inherited that sin “For all have sinned, and come short of the glory of God.” (Romans 3:23) The sin in our lives are like the air bubbles, sticks and stones and other impurities in the potter’s clay that prevents the potter from making a perfect vessel. If a potter were to allow the impurities and the sticks and stones to remain in the clay, he might be able to make a vessel, but that vessel would surely be marred and would surely explode in the flames of the potter’s furnace. The resulting shards would be good for nothing except the trash pile. Like the sticks and stones and other impurities in the clay, man’s sin needs to be removed so God can mold and shape us into a vessel that can be used for Him. Jeremiah told how the “…clay was marred in the hand of the potter; so he made it again another vessel…” Being born with sin the first time we need to be forgiven and re-made, so Jesus said “Ye must be born again” (John 3:3). It is through this re-birth that we are like re-made clay vessels, which are pleasing to God. Once we are these “new creatures” we can have fellowship with God and know the true purpose and meaning of life. 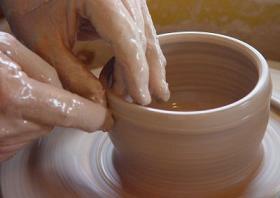 In order for the potter to create a perfect vessel, he will first wash the clay and remove all impurities. Slamming the clay on the wedging board and kneading it in a specific way the potter causes the clay to go through a multitude of “trials and tribulations” thereby preparing the clay for things to come. The act of centering the purified, washed, cleaned and wedged clay on the wheel can be compared to God’s way of allowing us to be exposed to all kinds of trials and tribulations, thereby nudging us ever closer to Him. So it is with centering: a little nudge here, a little nudge there and before one is even aware of it the clay is centered and ready to be shaped into a vessel that can be used. The hard part, for both the potter and the Christian is to remain centered and focused so that God can do His thing in our life. In closing, the process in becoming a vessel that can be used by God is a lifelong process. At no time in our life do we become “sinless and perfect”. Just forgiven. The debt owed by our sin is paid through His death and the shedding of His blood on the cross. God continues to work the clay that is our lives. He continues to work out the imperfections and failures that we deal with everyday. In order to create the perfect vessel, the clay has to be just right, it has to be centered and has to respond properly to the potter’s sensitive hands. We should compare the act of “centering” to the act of surrendering one ‘s self to God. The lessons learned from my failure in art class in 1977 are still with me today. Probably one of the greatest lessons is this… that when my clay was destroyed in the kiln all those years ago, it was over. I could not fix it. I could not salvage anything from it. I would not get a second chance in fixing it. Man is a lot like this. When we as Christians fail in our lives, most times other Christians do not give another person a second chance to allow God to re-work and re-mold the failed Believer. They are quick to dispose of the broken shards of clay that are on the floor. What I have learned is that God is all about second chances in this life. He can take the “marred clay” and the broken shards of clay that is our lives and shape and mold it and if we fail, He will continue to work it, re-mold it and shape it until we are called home to heaven. As a Christian who has failed in his life, I am comforted to know that one day I will be made “perfect” when I go home to be with Him in heaven. My prayer is that one day before I get called home to be with Him, I will be able to be a vessel that is worthy to be used again. While I am waiting, I will place my life in the hands of the Potter…willing to be molded, re-worked and shaped into a vessel that is pleasing to Him.